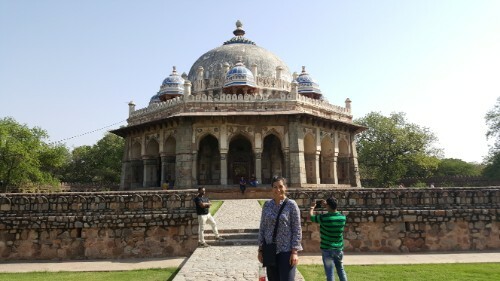 Our second day of exploring Delhi was… interesting. We unintentionally visited all of, what I have deemed, the most baffling places in the city. 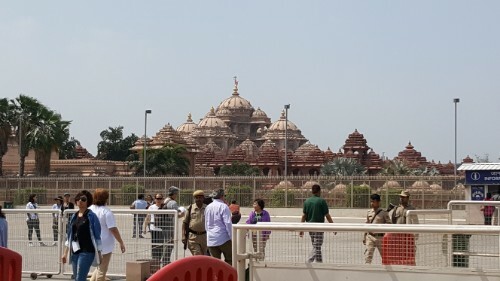 Our first stop was Akshardham temple. Andrew and Rohan had never been before, so it was a strange, new experience for all of us. There’s no entry fee, but they make up for that in over-the-top security measures and the fact that you can’t take pictures. I’ve never been through security like this. First, you go through a guardhouse where they looked through your bag. Next, you come to a building where you have to hand in certain items. This is where it started getting funny. I tried to just give them my whole little purse minus my wallet because you have to hand in your phone, so what else do I even have in there? They rejected my purse but then told me to remove “all electronics”. Uhh. Okay? So I gave them the little external battery pack I had too, and I had to give them the cord, as if I could do anything with that after giving up my phone and the battery pack. Then I had to give him my headphones, and finally he asked for my hand sanitizer. What the heck am I going to do with either of those? But whatever. At this point, my purse was practically empty anyway, so I’m not really sure why they wouldn’t just take it. The first and only picture I took before my phone was locked up. The next step was security. You always get split into men and women here, so I went in the women’s line and walked through a questionably functional metal detector, had everything taken out of my bag again (though apparently the granola bar I had was no problem), and got the world’s least thorough pat down which did, however, include the woman asking me if the bump she felt from my pants drawstring was a phone. Likely. And finally, we were in. None of us had done any real research on the place, so we just assumed that it was some old temple. I quickly started questioning that once we got into the complex. Everything looked too sharp. The carvings were crisp and perfect, and it didn’t feel old. When we entered the actual temple (shoe-less, of course), there was lighting integrated into the shrines, and it didn’t look like it was added in after construction. Suspicious. Rohan went and asked an employee when it was built… 2005. Hahahahahaha I literally burst out laughing. Here we are, thinking it’s some sacred piece of history, and it’s barely more than 10 years old. We kept joking and laughing about it throughout the day. That also explained why everything looked so fresh. Some of the carving was done by machines (so it amazingly only took 5 years to complete! ), though the detail work was done by hand, and there hasn’t been nearly enough time for it to start showing any wear and tear. The building is beautiful, and I’m glad we went, but how funny is that? 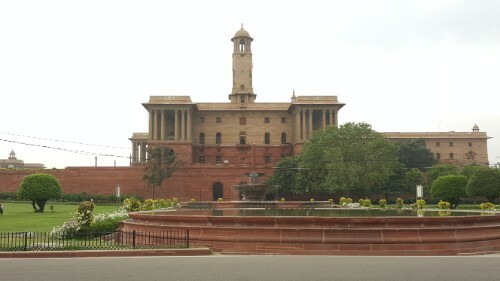 It’s supposed to celebrate and showcase India’s architectural history, so I guess I have to say, “good job,” to the designers. You fooled us! Inside the temple, we also learned about Swaminarayan, an important figure in modern Hinduism. His followers believe that he was a physical manifestation of God. He did a lot of good things for women in India, including advocating for women’s education, discouraging the killing of female babies, and speaking against the ill-treatment of women. The temple is dedicated to him and contains an exhibit that includes impressions of his feet, and… wait for it… actual hair and nail clippings! Yeah, that’s too much for me I think. Can you imagine being such a big deal that someone would want your nail clippings? 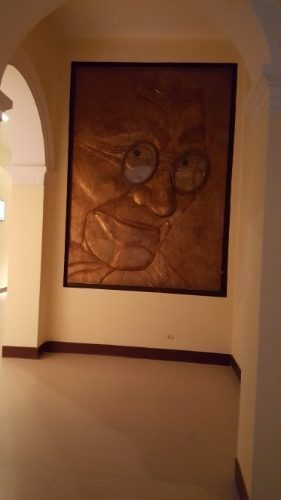 There was also a lot of large artwork of Gandhi’s head. One of the other ones had little screens in his eyes. That was weird. Okay wow I managed to say a lot more about the temple that I expected. 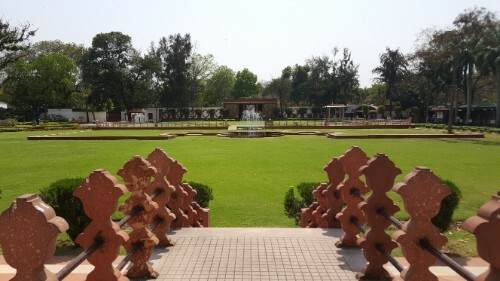 The next stop after that was Gandhi Smriti, the place where Gandhi was assassinated. 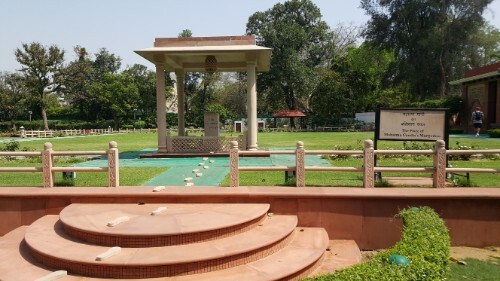 There is now a Gandhi museum on the site as well, and that’s near the top of the list of the weirdest museums I’ve ever been to. It has a “multimedia exhibit” with LOTS of multimedia elements and no explanations of anything. There’s nothing saying what anything is, how it works, or why it’s significant. There was a woman following us around and pointing us in the direction of the next room throughout our visit, so I guess she was our unofficial guide. The whole thing was just baffling. 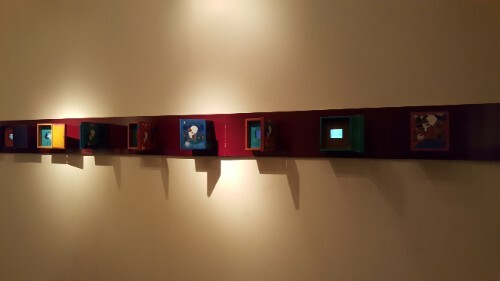 There was one room with all of these little wooden boxes on the walls, and one wall of boxes contained little screens that were playing footage from one of Gandhi’s marches. Why the boxes? I felt like I was in some weird alternate reality. I have literally no idea what the purpose of this is. 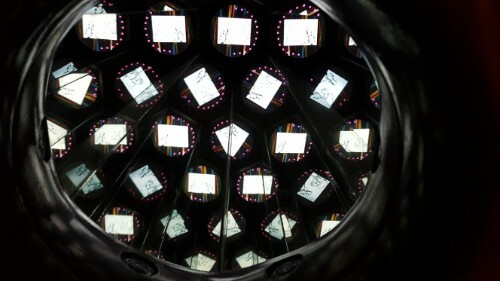 It’s like a kaleidoscope kind of… you look in one end, there’s a screen at the opposite end, and the space in between is filled with mirrors. The multimedia exhibit was strange, but there was also a helpful and informative exhibit of dioramas that gave a good timeline of Gandhi’s life. 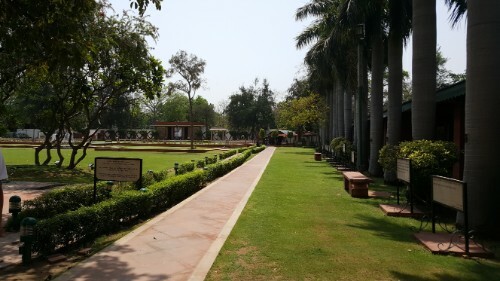 Filled with new Gandhi knowledge, we walked around the gardens and saw the spot where he was shot during an evening prayer ceremony. It’s an eerie juxtaposition of a horrible history and a peaceful garden. I’m standing on a bridge over dry land. Very functional, right? But this is a nice view of the garden. 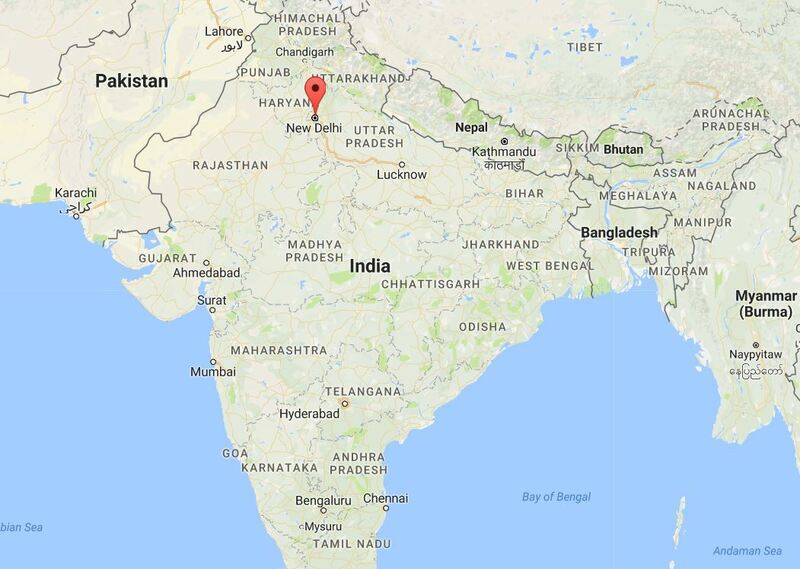 Here’s the location of Delhi, for reference. 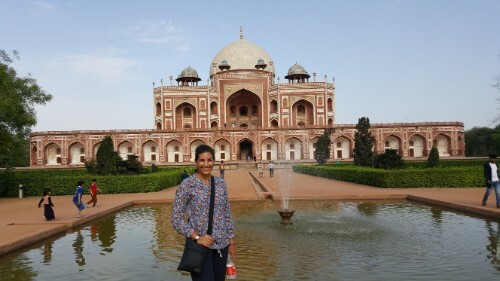 We hit the ground running on my first day in Delhi. We have three sightseeing days scheduled before flying to my final destination, so I wanted to see as much as possible. I wasn’t worried about having any jetlag because I landed at night, and if there’s one thing I can always do to get onto the right time schedule, it’s sleep. I had no trouble going to bed after getting to our hotel, and when I woke up in the morning, I was ready to go. My friends for the first few sightseeing days in Delhi are Andrew, the guy who helped to organize my trip here, and Rohan, a Delhi-ite who is a friend of a friend. Andrew had an ambitious list of places to visit on day one, and we managed to get through them all! I’m all about efficient sightseeing. I can’t even count the number of tuk-tuks we took (took… lol get it? I know, I’m too funny) today, but they made it possible for us to quickly zip around the city. 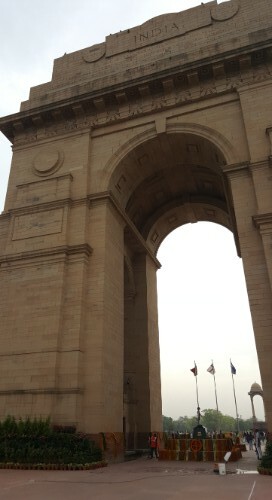 The first stop was India Gate, a war memorial triumphal arch. 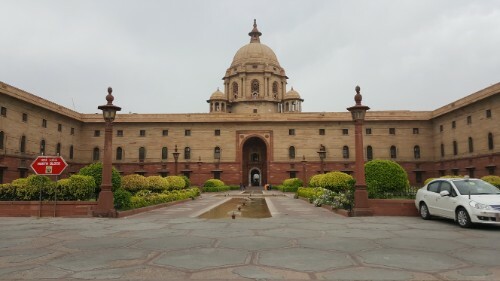 It’s located on the same stretch of road as the President’s house and other government buildings like Parliament and some department headquarters. Most of these buildings were designed by the same British architect, and the others were designed by one other British architect. It’s not hard to tell that they weren’t Indian designs. They look like someone picked them out of a catalog for British architecture and plopped them down in India instead of the UK. This is as close as you can get to the President’s house without being special. Maybe you can make an appointment or something, but this was as close as we could get. 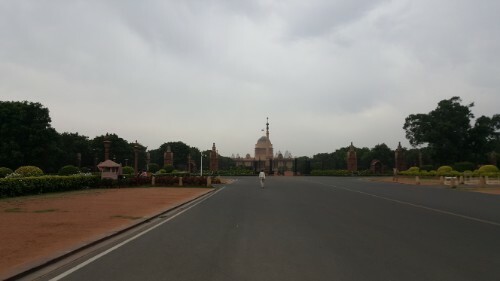 From there, we made our way to the Red Fort, the former home of many of the Mughal emperors. That’s who was in power before the European power struggle that resulted in the colonization of India by the British. 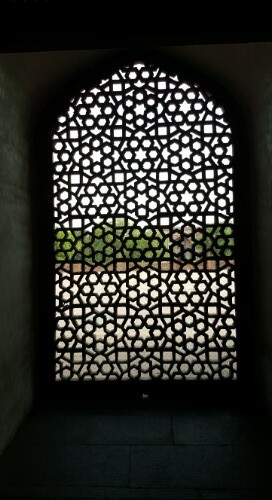 The fort was built in 1639 by Emperor Shah Jahan, the same guy who was responsible for the Taj Mahal. 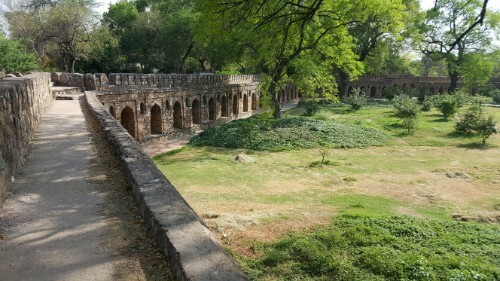 The outer wall encloses over 250 acres with 1.5 miles of wall. That’s crazy. We didn’t go inside, but I think a lot of the interior was plundered and destroyed throughout history anyway. 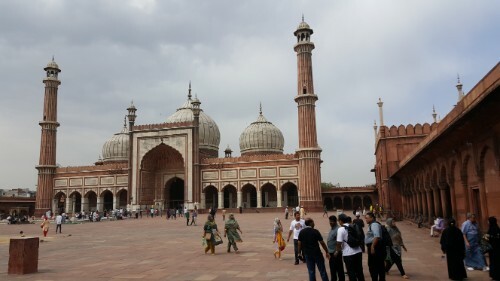 A short walk from the Red Fort gets you to the Jama Masjid, one of the biggest mosques in India. 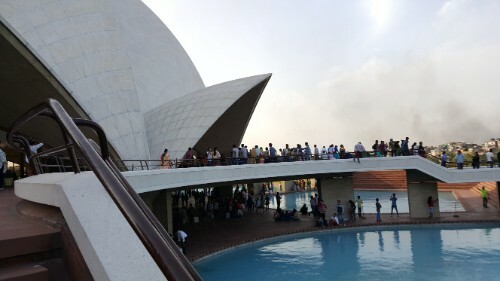 If you’re Indian, you can get in for free. If you’re not, you have to pay the “tourist tax” (as in, EVERYTHING is more expensive here if you’re not Indian). You also have to take off your shoes to enter, and this is where I fell in love with barefoot culture. It feels so weird! Even when you “enter” you’re still outside, just in a courtyard. And you’re walking around barefoot. And so is everyone else. How weird, right? But here, it’s completely normal, and I intend to fully embrace it. 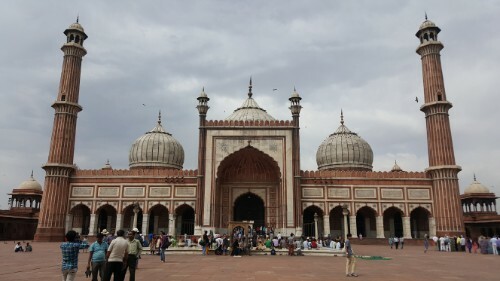 Anyway, this mosque was also built by Shah Jahan in the mid-1600s. Busy guy. The courtyard is huge, and they say that 25,000 people can pray in it at the same time. The architecture is absolutely beautiful. Shah Jahan was clearly not the kind of guy who was okay with second best. At this point, it was about 1PM and things were starting to heat up. We decided to head to Connaught Place, a shopping area, to find some lunch and hide from the sun. I’ll give you one guess as to who built Connaught Place… most British name ever. We went to a place with Mughal cuisine for lunch, and apparently that means spicy. I mean, I expected it, but that doesn’t change the fact that I’m pathetic and can’t handle it. We got a bunch of things whose names mean nothing to me: mutton korma (lamb in some spicy sauce), chicken biryani (like fried rice but spicy), and khameeri naan (bread and my mouth’s lifesaver). I think my nose was running for all of lunch, and I ate like half the bread at the end trying to get the spicy taste out of my mouth. 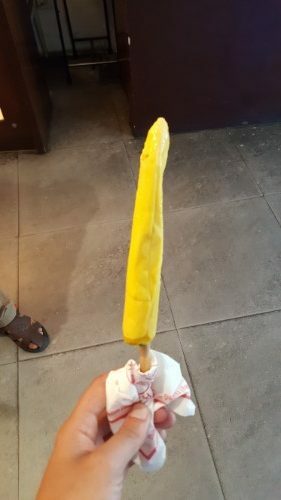 We got some kulfi (ice cream on a stick, but with indescribable taste and texture) to cool us down and also because who needs a reason for ice cream? We only had a couple more stops to make after lunch. 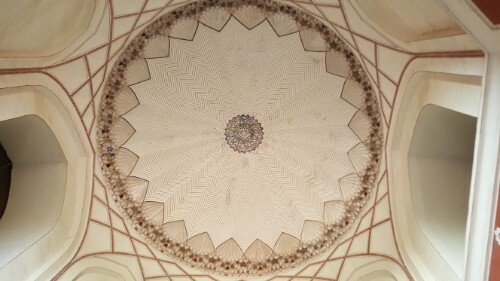 Number one was Humayun’s Tomb. 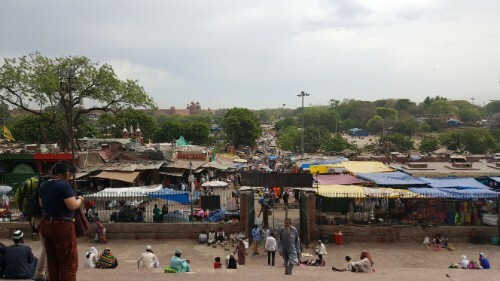 This is another tourist taxed location… it’s something like 50 cents for an Indian to enter and 5 dollars for a foreigner. 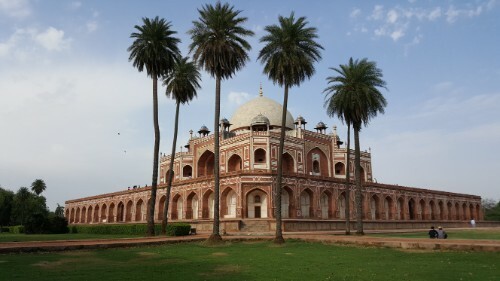 The complex has more than just Mughal Emperor Humayun’s tomb, though that building is definitely the highlight. 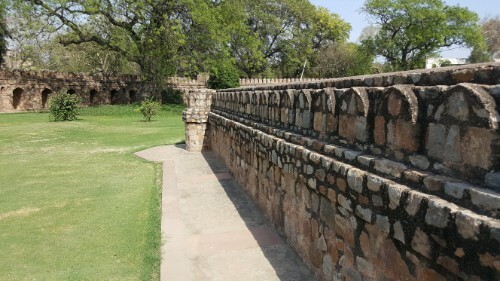 There are some other monuments on the grounds, plus the 1547 tomb of Isa Khan, a noble who fought against the Mughals. 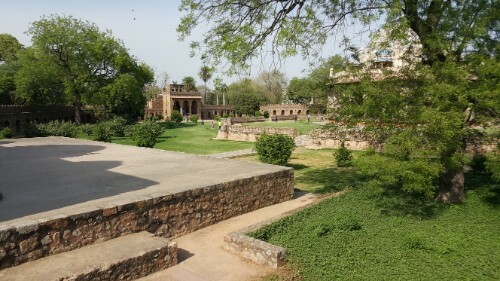 Humayun’s tomb was built in 1572 by the Emperor’s wife, and now in addition to him, she and some other significant Mughals are buried there as well. The tomb is spectacular. 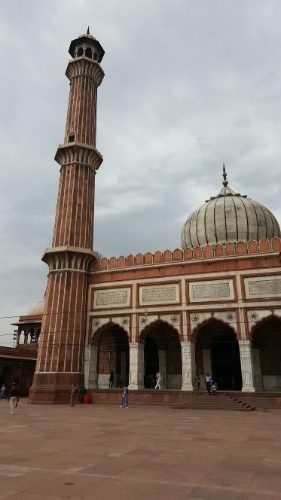 It came before the Taj Mahal, and it’s obvious that the Taj was built after looking at it. They have a lot of architectural similarities, though material-wise, they’re quite different. 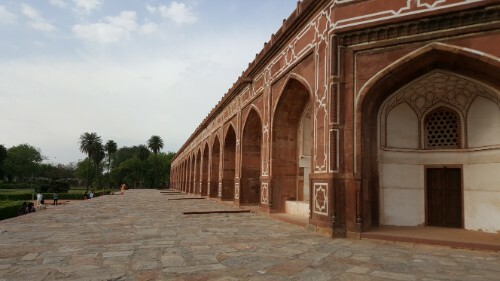 Humayun’s tomb is built from red sandstone. It’s undergone a lot of restoration work recently, so the building looks quite good actually. They also had an exhibit talking about the restoration work which was cool. I’m fascinated by that stuff. Fun fact – the finial on top is gilded in actual gold. Okay, don’t worry, we’re almost finished. Now, the last stop of the day! 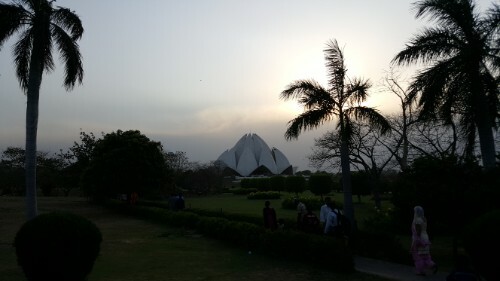 We went to Lotus Temple, a Bahai temple. The Bahai faith is one that I had never heard of before, and honestly it seems more like a nice worldview rather than a religion. It started around 1844 and talks about the “oneness” of the human race, unity of people, condemnation of prejudice, gender equality, shrinking the wealth gap, the value of hard work, and the establishment of peace. See that guy on top of the right petal? How would you like to be up there? All that aside, the building is awesome. 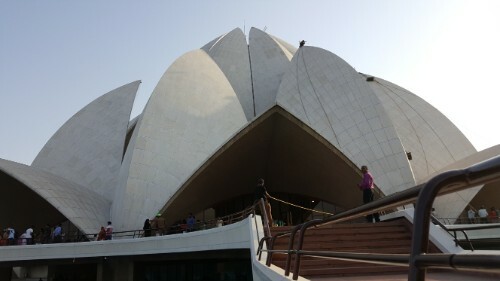 It’s made to look like a lotus flower, and each “petal” is covered in marble. I have no idea how they built the thing, but it’s beautiful, and from the inside is just mind-blowing. 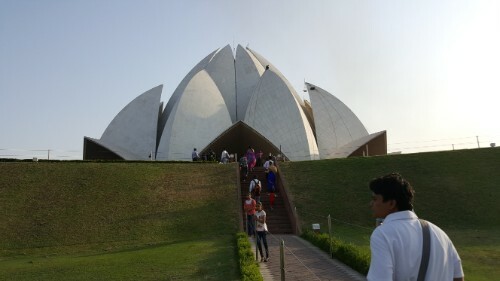 Anyone can enter for free, but you have to take your shoes off, can’t talk, and can’t take pictures inside because it’s a place of worship. You can stay as long as you’d like and pray though, regardless of your religion. The whole concept is very interesting. While I was sitting and attempting to pray, I’m pretty sure that I was falling asleep in my seat. The day took quite a toll on me, but I was happy that we had a chance to see so many things. 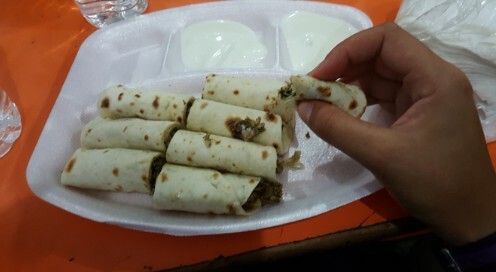 We stopped and grabbed some dinner – spicy (of course) lamb shawarma – before heading back to the hotel and crashing. Welcome to India!!! Whew! It’s been a whirlwind couple of weeks. When I first landed here, my brain was not ready to register being in a new country yet. I’m still getting used to remembering where I am. How weird is that? This is definitely not a problem I would have expected to ever have. Who the heck loses track of what country they’re in? How much do you have to travel for that to happen? Well, I guess that three countries in four days is my limit. I landed in Delhi around 9PM last night and zombie-walked my way through immigration and customs. Thankfully it all went without a hitch because I don’t think I had the capacity to deal with any issues after 24ish hours of travelling. I connected no problem with my ride, and we headed off to the hotel to crash for the night before a big day of sightseeing today! 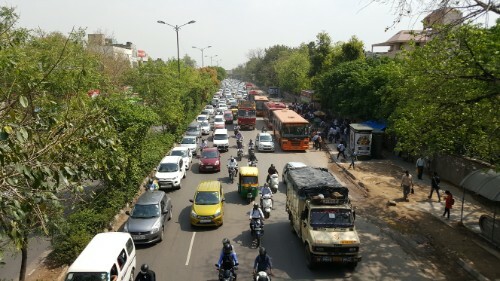 Traffic view. This definitely isn’t the worst case but I was on a bridge, so I had to just take what I could get at the moment. People are always talking about the traffic here and how crazy it is, so I was expecting something insane. Yes, it’s definitely hectic, but I’ve had experiences in Peru and China that are pretty darn close. There are some distinguishing factors here though. Driving on the left – I think I knew this at some point, but I COMPELTELY forgot that they drive on the left here. When I got picked up from the airport, I had a momentary head spin when I got in the car and the driver was on the wrong side. Honking horns – Everyone uses their horn as if everyone else in the world is blind, and the only way that they’ll know you’re coming is if you’re honking. You honk if you’re passing someone, if someone is crossing the street and you’re going to hit them, if someone even looks like they might be thinking about crossing the street, if an animal looks like it might be in your way, if you’re in completely stopped traffic and you need to make yourself feel better about not going anywhere, etc. You name an opportunity, and someone is probably honking. Vehicle variety/quantity – The biggest thing that makes it more chaotic than other countries I’ve been to is that there are WAY more motorcycles and tuk-tuks (these are the same as motos in Peru – like a motorcycle rickshaw, or a motorcycle tricycle as I like to think of them) on the road. They weave in and out of the cars and drive kind of like nutcases. There are also bike rickshaws, normal bikes, other motorbike-related vehicles that I’ve never seen before, trucks, buses, and more. I’ve never seen such vehicle variety. Not a great picture, but you can see a woman riding sidesaddle on the front motorcycle. Motorcycle sidesaddle – This might be one of the most impressive things I’ve ever seen. 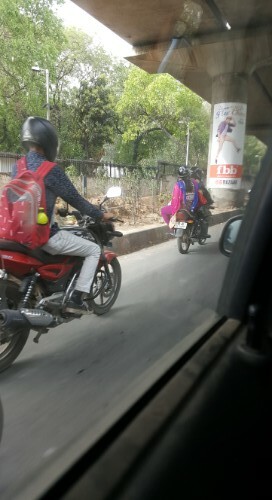 Sometimes, women (especially when wearing a skirt) will ride on the back of motorcycles with both legs on one side, like riding a horse sidesaddle. To me, this is an incredible feat. How do they stay on? Is that not terrifying? Crossing the street – This is most similar to my experiences in China. When you cross the street, you need to be aggressive, but not TOO aggressive. It’s like a dance where if you step wrong, instead of getting some stubbed toes, you get hit by a car (or tuk-tuk or motorcycle or who knows what else). Sounds fun, right? The best strategy is to hide behind someone else while you’re crossing so that if anything goes wrong, they get hit instead of you. Smog – This is another one that I knew about but forgot. If you haven’t been to a smoggy country before, just imagine that every day is a little foggy, but that fog is slowly killing you. The difference in your breathing and how the air feels between smoggy countries and ones with clean air are VERY easy to perceive. Thank goodness for emissions regulations in the US! Trash – Like Ghana, there’s a lot of trash everywhere. If you think US cities are dirty, come here. It’s gross. Water bottles – When you finish a water bottle, you’re supposed to crumple up the bottle before you throw it away (it even says so on the label). This is so that people can’t trash-pick the bottle, refill it with un-filtered water, “reseal” it, and sell it to an unsuspecting victim. Water – Speaking of water, as a foreigner, you pretty much have to drink bottled water (unless you want to spend a lot of time and effort purifying the tap water). Besides possibly containing bacteria that can give you anything from cholera to typhoid, some of the water has heavy metals including arsenic. You know, arsenic… aka poison. Everyone, please take a moment to take a deep breath, drink some tap water, and appreciate your clean water and air. Don’t take these things for granted! 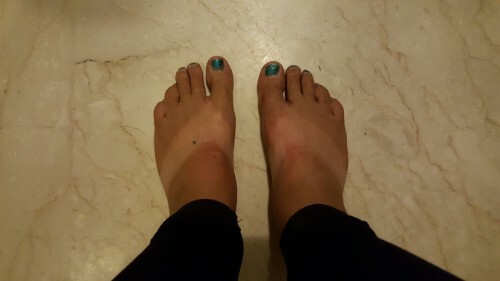 Dirt or tan lines? Hint: it’s dirt. All dirt. Dirt – Do we have less dirt in the US than in other countries? I don’t know, but I never feel so grimy at home. Here, plus in Ghana and somewhat Peru, I constantly feel like I’m covered with a layer of grime. It’s like there’s dirt seeping out of my pores. It’s impossible to keep anything clean. Architecture – There is some REALLY cool stuff here. I’ll post more about what we saw today later, but just know that it’s pretty awesome. There are so many different styles happening here because of all of the different rulers and influences that have come in over India’s history, and it’s interesting to see them all interact. Tomb architecture is quickly becoming my favorite. Barefoot culture – If you like going barefoot, this might be the place for you. We went into a couple temples today, and when you go inside, you have to take your shoes off. It feels very weird taking off your shoes and walking around in public but at the same time, very liberating. I <3 barefoot temples. Okay, that’s all for now. So far, I’m enjoying being here. More details to come soon, I promise!